Check out GoldStar's clear inside frame and rolling dolly keel support system. Add in the outboard air suspension plus shock absorbers and the hydraulically operated frame and arms, and you've got extra low, extra easy handling for all sizes and types of power boats and shoal draft sailboats. 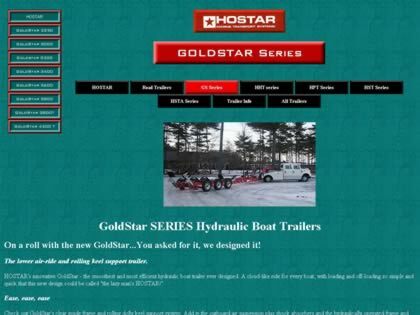 Web Site Snapshot: If available, above is a snapshot of the Hostar Hydraulic Boat Trailers web site at http://www.hostarmarine.com/ as it appeared when this site was added to the directory or last verified. Please Note that Boat Design Net has no involvement with the above web site; all content and images depicted in the above thumbnail are the property and copyright of Hostar Hydraulic Boat Trailers unless otherwise noted on that site. Description: Check out GoldStar's clear inside frame and rolling dolly keel support system. Add in the outboard air suspension plus shock absorbers and the hydraulically operated frame and arms, and you've got extra low, extra easy handling for all sizes and types of power boats and shoal draft sailboats.